Set in Tamilnadu, India, ‘Our Family’ brings together excerpts from Nirvanam, a one person performance, by Pritham K. Chakravarthy and a family of three generations of trans-gendered female subjects. Aasha, Seetha and Dhana, who are bound together by ties of adoption, belong to the community called Aravanis. The film juxtaposes the ‘normality’ of their existence with the dark and powerful narrative by Pritham- ‘Nirvanam’; Nirvanam (Liberation) refers to the act of liberating oneself from the male body and transforming oneself to a female. This narrative bears witness to the tumultuous journey towards a reinvented selfhood, a journey fraught with violence, exploitation, affection and courage. The pains, pleasures and dilemmas of becoming the ‘other’ is the motif of the film. Weaving together performance, life histories and everyday life, it problematises the divides between ‘us’ and ‘them’. 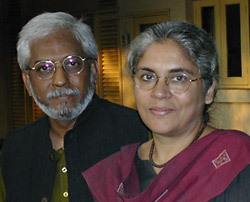 Anjali Monteiro is Professor, and K.P. Jayasankar is Professor and Chair in Centre for Media and Cultural Studies, Tata Institute of Social Sciences, Mumbai. Both of them are involved in media production, teaching and research. A presiding thematic of much of their work has been a problematising of notions of self and the other, of normality and deviance, of the local and the global, through the exploration of diverse narratives and rituals. Jointly they have won twenty one national and international awards for their films. They have several papers in the area of media and cultural studies and have contributed to scholarly journals such as Cultural Studies. They are both actively involved in Vikalp and Films for Freedom, which are collectives of documentary filmmakers campaigning for freedom of expression. They are also associated with various media and voluntary organisations.